VINTAGE COSTUME ANTIQUE ESTATE JEWELRY BROOCHES AND PINS! 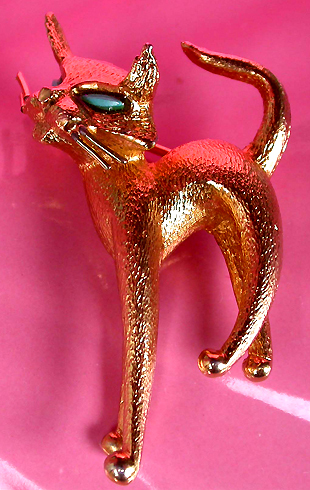 Signed Jomaz Figurine Cat Goldtone Vintage Estate Antique Brooch Pin For Weddings, Proms, Pageants And Parties! 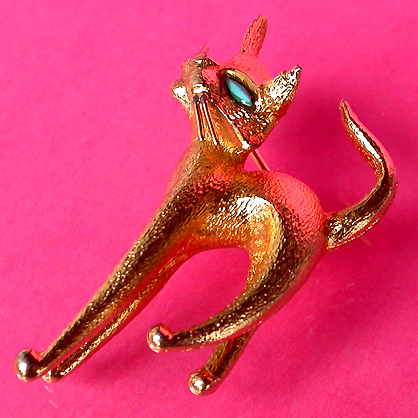 Item #P168314 - Signed Jomaz Figurine Cat Goldtone Vintage Estate Antique Brooch Pin. Size: Length: 2". Width: 1". Signed Jomaz designer figurine vintage brooch! A cat's meow... 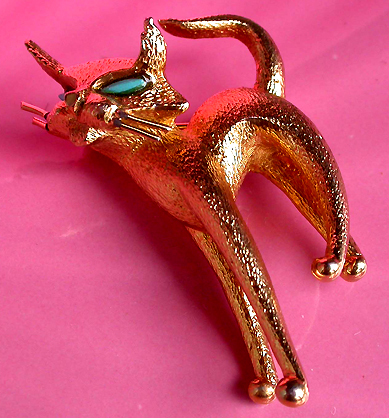 This adorable kitty has a beautiful shimmery matte goldtone finish and tortoise blue glass stones for eyes. Gold spray whiskers, tall tail, purring, circling, rolling over and rubbing against your legs demanding a belly rub now! This love-staffed kitty wants you to take him home. Excellent condition. A fabulous brooch pin to wear at weddings, prom nights, pageants, parties, cruises and special functions! Price US$88.00. SOLD.